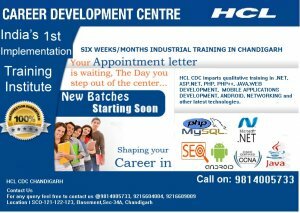 HCL CDC invites Industrial Training for BE, B.Tech, MCA students in Chandigarh. Now HCL CDC the real IT giant offers Limited seats for Industrial Project Training in Chandigarh. The live Project Training module of our course can make a huge difference to your profile and career prospects. So don’t settle for the second-best. Choose WINNERS i.e. HCL CDC. Training at HCL CDC brings you directly in touch with industry experts & sets the right base for leading vendor certification. Our alliance with leading IT corporations such as MICROSOFT, RED HAT, JAVA & ORACLE provides us with valuable input for IT education. Eligibility – MCA / B. Tech./B. C. A /B. E /MSC (IT & CS) /BSC (IT)/Diploma.